Hey, everybody, it's time to stop thinking you can figure out Bob Dylan's next move. Haven't the past fifty years taught us anything on that front? His new record, Fallen Angels, continues in the rich and all-American vein of the one before that, Shadows In The Night (2015). With covers of songs sung by his fellow Columbia recording artist Frank Sinatra, as well as by many others, Dylan is having a very good year - and a palpably good time in the studio as singer and producer. These are songs of his childhood: the soaring, silly "Skylark," which is just as old as Dylan is; "That Old Black Magic," a monster hit for Glenn Miller and his orchestra a year later; and on up to 1957, when Dylan was sixteen, and "All The Way" was released. There are also songs he grew up hearing from the generation before, written in the 1920s and 1930s in the great late days of Tin Pan Alley. The slow, dreamy Jazz Age standard "It Had To Be You" is a lazy, lovely lyric on Fallen Angels; "On A Little Street In Singapore" becomes a swingy new song (and you get to hear Dylan singing about lotus-covered doors and perfumes of Shalimar, which personally delights me). Dylan hasn't chosen any of these songs accidentally - listen to the beginnings. When he sings "Why do I do just as you say? Why must I just give you your way?" you can hear the grin. He's not doing anything he's told to do; he doesn't give anyone their way. "It Had To Be You" and "That Old Black Magic" are my favorite tracks on the record. Dylan's phrasing on "It Had To Be You" is impeccable -- it reminds me of something Emmylou Harris said once. Of course, Gram Parsons' band was called the Fallen Angels, and Harris was still reeling from Parsons' death at 26 when she joined Dylan on duets for Desire (1976). "[Dylan's] phrasing changes a lot," said Harris, and to keep time with him she "watched him all the time....I just watched his mouth and watched what he was saying." 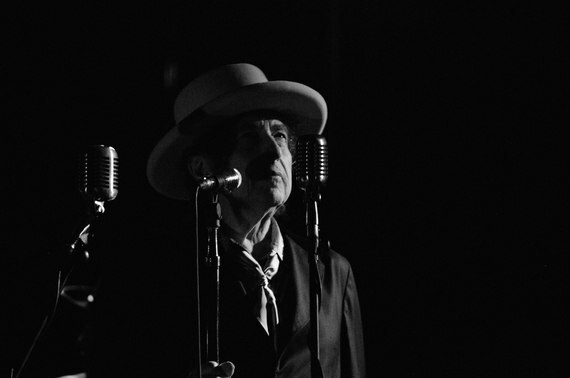 Dylan's longtime band members are just as watchful, matching their skillful, rich, dreaming instrumentals to his voice. 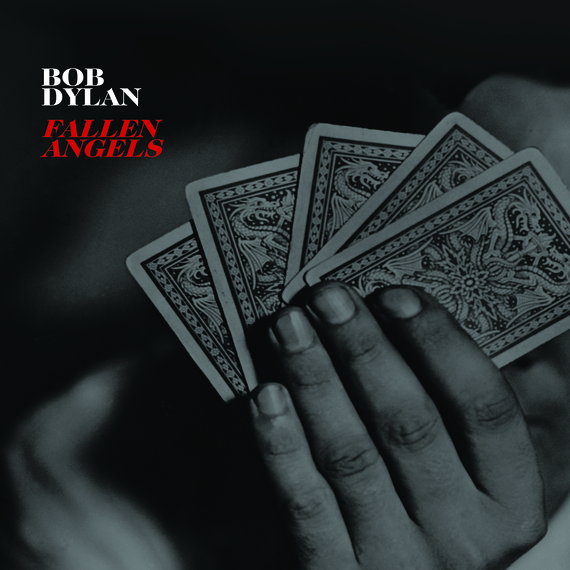 Quite often on Fallen Angels, you can hear Dylan breathing as he is about to begin a line, which makes the songs feel live. "That Old Black Magic" is a riffling, skiffly delight from George Recile's snappy start to the last refrain. When, on the last "under that old black magic called love," Dylan laughs between "that" and "old" you can hear how much fun he's having, singing this song. Want to feel Dylan's undisputable genius as a singer-songwriter? Go listen to him sing "Tangled Up In Blue," or "She Belongs To Me," or "Beyond Here Lies Nothin'" for you, somewhere in the world, just about any night of the year -- that's how often he still performs live. Want to enjoy him having fun, and learn something about songs that matter to him - and in the course of popular music history? Listen to Fallen Angels, available now as a stream via NPR. Times have changed, and our angels now may be mostly fallen ones - but like all fallen angels, even those who go by a different name after the fall, they're angels still.